As the push for war against Syria continues and as the President prepares a propaganda assault against the distracted American public regarding the Administration’s assertion that Syrian President Bashar al-Assad has used chemical weapons on his own people, many informed observers are having flashbacks to Iraq in 2003. Such a comparison between the Iraq invasion and the current push to attack Syria is not without warrant. In fact, the parallels between the events leading up to the Anglo-American invasion of Iraq and the planned repeat against Syria not only exist but are strikingly similar. Thankfully, however, the thirst for war which was so present in the minds of the American public in 2003 seems to have waned slightly due to a culmination of apathy and disastrous results of foreign military adventures in recent years. 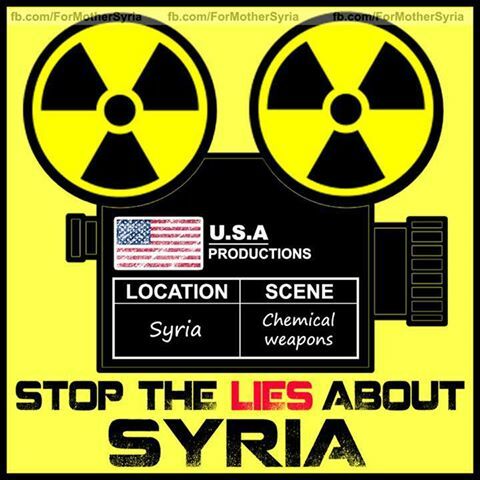 Nevertheless, the propaganda push to gain control over the hearts and minds of the American people continues in full force, with Skull and Bones John Kerry repeating the same tired claims of convincing evidence and incontrovertible proof of Assad’s use of chemical weapons while, at the same time, refusing to show such proof to Congress or the American people. Of course, whatever “proof” that has been shown has done nothing to bolster the Administration’s claims. In fact, the documents presented to lawmakers have actually raised more questions than they have answered. Thus, with the ability of a sustained propaganda assault on an entertainment-obsessed population to become more and more successful as time moves on, it is important to understand just what “evidence” is being cleverly presented to us as justification for war. Below are just a few reasons to question the “evidence” and “proof” presented by the Administration regarding the use of chemical weapons in Syria by the Assad government. Much of the information presented to the American people, where it is enumerated at all, revolves around shadowy “intelligence” in the same way as the Iraqi WMD claims were presented to the public during 2003. That is to say that there is only the statement of the possession of “intelligence” but never a presentation of the actual intelligence itself. The bulk of the so-called concrete evidence that has been produced, however, is an alleged intercepted phone conversation between a Syrian Ministry of Defense official and a member of a Syrian chemical weapons unit that was obtained by none other than the Israeli Defense Force intelligence unit which goes by the number 8200, the largest unit in the IDF. The mainstream Western media , of course, has attempted to portray these calls (if they are even authentic) as proof that Assad and Syrian government forces were the responsible party for the chemical attacks in Ghouta. However, a close look at the calls and the content therein reveals several conflicting aspects of the narrative being pushed by Western governments and media outlets. For instance, the calls are supposed to reveal that these Syrian officials, “exchanged panicked phone calls with a leader of a chemical weapons unit, demanding answers for a nerve agent strike that killed more than 1,000 people,” in Ghouta. Without disputing the claim of 1,000 dead, a figure provided by the death squads and Saudi media outlet Al-Arabiya, one should certainly wonder how a government which launches a chemical weapons attack would then be surprised and demand answers regarding the chemical weapons attack it had launched. Why would the official be demanding answers for a chemical attack if the government was responsible for it? Of course, media outlets such as Foreign Policy, the official new agency of the Council on Foreign Relations attempted to spin the obvious contradiction as the result of a Syrian military officer going rogue and “overstepping his bounds.” Still, if this was the case (and it should be stressed that there is no evidence that it is), it would only go to show that the Syrian government did not order such an attack and that, in order to do so, this rogue officer would have had to violate his chain of command and Syrian military procedure. Thus, the intercepted calls do nothing to build the case for the guilt of the Syrian government, much less a case for war. The only other form of “proof” provided by the Anglo-Americans revolves around highly dubious if not outright faked or non-existent samples allegedly taken from Ghouta by “first responders in East Damascus.” Secretary of State John Kerry stated, that “those samples of hair and blood have been tested, and they have reported positive for signatures of sarin.” Unfortunately for Kerry, he and the rest of his warmongering ilk have been entirely unable to present any real evidence to back up these claims. Of course, because the UN investigation has been hampered by both the death squads and the United States, the White House claims that only the mysterious “samples” taken by shadowy “first responders” which were then tested and analyzed by secret agents of the very government which has been relentless in its push for war against Syria is admissible as justification for military action. The U.S. government insists it has the intelligence to prove it, but the public has yet to see a single piece of concrete evidence produced by U.S. intelligence - no satellite imagery, no transcripts of Syrian military communications - connecting the government of President Bashar Assad to the alleged chemical weapons attack last month that killed hundreds of people. In its absence, Damascus and its ally Russia have aggressively pushed another scenario: that rebels carried out the Aug. 21 chemical attack. Neither has produced evidence for that case, either. That's left more questions than answers as the U.S. threatens a possible military strike. Yet one week after Secretary of State John Kerry outlined the case against Assad, Americans - at least those without access to classified reports - haven't seen a shred of his proof. The Obama administration, searching for support from a divided Congress and skeptical world leaders, says its own assessment is based mainly on satellite and signals intelligence, including intercepted communications and satellite images indicating that in the three days prior to the attack that the regime was preparing to use poisonous gas. Yet the assessment, also based on accounts by Syrian activists and hundreds of YouTube videos of the attack's aftermath, has confounded many experts who cannot fathom what might have motivated Assad to unleash weapons of mass destruction on his own people - especially while U.N. experts were nearby and at a time when his troops had the upper hand on the ground. In short, John Kerry’s “strong case” against Assad is no case at all. In addition, McDonough stated that, by attacking Syria, the United States would be sending a message to Iran to cease their alleged attempts at developing a nuclear weapon and saying that this military strike would be a chance “to be bold with Iran.” This, of course, is in direct contradiction to the propaganda being fed to the American people who have heretofore been told that the reason for the assault is due to a humanitarian tragedy, not merely for political intimidation. The answer highlights how the White House still has not shown the public a concrete piece of intelligence that directly connect Assad’s regime to the alleged chemical weapons attack, as the Associated Press points out in a detailed story. Meanwhile, Syria and Russia insist it was the rebels who used chemical weapons, a charge they have also failed to prove with any actual evidence. 3.) The Evidence being presented represents the rush to war, not an actual intelligence assessment. Clearly, as any observer should understand, the rush to war and the propaganda push toward a stampede in that direction has rendered any reports of “intelligence” by the United States government and the rest of the Anglo-American world and/or Israel highly questionable at best. Recent memories of concrete “intelligence” allegedly proving the presence of WMDs in Iraq should serve as a prompt for the requirement of incontrovertible proof by the American people whenever the discussion of military action enter into the equation. Yet the intelligence being presented to the American people is not only based entirely upon a political motivation, the reality is that the report does not actually represent the true “intelligence” picture of the very intelligence agencies who are tasked with analyzing the facts on the ground. Rather, the report is nothing but the conglomeration of cherry-picked intelligence which has been arranged to produce a picture that bolsters the position of the warmongers in the Anglo-American pyramid governing structure. Even some former intelligence officials have stated this much in an interview with IPS news, claiming that the chemical warfare intelligence summary is not the presentation of intelligence agencies complete with their unbiased professional analysis (assuming that this would even be possible in the first place), but an entirely political document consisting of lies and opinions coming from the White House. The evidence indicates that Director of National Intelligence James Clapper culled intelligence analyses from various agencies and by the White House itself, but that the White House itself had the final say in the contents of the document. Leading members of Congress to believe that the document was an intelligence community assessment and thus represents a credible picture of the intelligence on the alleged chemical attack of Aug. 21 has been a central element in the Obama administration’s case for war in Syria. That part of the strategy, at least, has been successful. Despite strong opposition in Congress to the proposed military strike in Syria, no one in either chamber has yet challenged the administration’s characterisation of the intelligence. But the administration is vulnerable to the charge that it has put out an intelligence document that does not fully and accurately reflect the views of intelligence analysts. Former intelligence officials told IPS that that the paper does not represent a genuine intelligence community assessment but rather one reflecting a predominantly Obama administration influence. In essence, the White House selected those elements of the intelligence community assessments that supported the administration’s policy of planning a strike against the Syrian government force and omitted those that didn’t. In a radical departure from normal practice involving summaries or excerpts of intelligence documents that are made public, the Syria chemical weapons intelligence summary document was not released by the Office of the Director of National Intelligence but by the White House Office of the Press Secretary. It was titled “Government Assessment of the Syrian Government’s Use of Chemical Weapons on August 21, 2013.” The first sentence begins, “The United States government assesses,” and the second sentence begins, “We assess”. The introductory paragraph refers to the main body of the text as a summary of “the intelligence community’s analysis” of the issue, rather than as an “intelligence community assessment”, which would have been used had the entire intelligence community endorsed the document. A former senior intelligence official who asked not to be identified told IPS in an e-mail Friday that the language used by the White House “means that this is not an intelligence community document”. Greg Thielmann, whose last position before retiring from the State Department was director of the Strategic, Proliferation and Military Affairs Office in the Bureau of Intelligence and Research, told IPS he has never seen a government document labeled “Government Assessment” either. Comparable intelligence community assessments in the past, he observed – including the 2002 Iraq WMD estimate – include indications of differences in assessment among elements of the community. IPS also raises the question of whether or not Director of National Intelligence James Clapper, while involved in the compilation of the document, refused to attach his name to it due to lack of confidence in the report after it was revised and doctored by the White House. Clapper’s name is nowhere to be found on the document. 4.) Even members of Congress have serious doubts about the evidence. While the U.S. Congress has never been particularly known for its ability to examine evidence and make an informed decision on it (absent a powerful financial lobbying campaign), some members, after having viewed the intelligence document, have openly stated that they question the veracity of the claims therein and are not convinced by what they have seen. What I heard in Obama admn briefing actually makes me more skeptical of certain significant aspects of Pres’s case for attacking. Attended another classified briefing on #Syria & reviewed add’l materials. Now more skeptical than ever. Can’t believe Pres is pushing war. If Americans could read classified docs, they’d be even more against #Syria action. Obama admn’s public statements aremisleading at best. I have just attended a classified Congressional briefing on Syria that quite frankly raised more questions than it answered. I found the evidence presented by Administration officials to be circumstantial. Yes, I saw the classified documents. They were pretty thin. Senator Joe Manchin announced he was voting “no” for a Syria strike right after hearing a classified intelligence brieifng. The documentary record regarding an attack on Syria consists of just two papers: a four-page unclassified summary and a 12-page classified summary. The first enumerates only the evidence in favor of an attack. I’m not allowed to tell you what’s in the classified summary, but you can draw your own conclusion. And yet we members are supposed to accept, without question, that the proponents of a strike on Syria have accurately depicted the underlying evidence, even though the proponents refuse to show any of it to us or to the American public. In fact, even gaining access to just the classified summary involves a series of unreasonably high hurdles. We have to descend into the bowels of the Capitol Visitors Center, to a room four levels underground. Per the instructions of the chairman of the House Intelligence Committee, note-taking is not allowed. Once we leave, we are not permitted to discuss the classified summary with the public, the media, our constituents or even other members. Nor are we allowed to do anything to verify the validity of the information that has been provided. And this is just the classified summary. It is my understanding that the House Intelligence Committee made a formal request for the underlying intelligence reports several days ago. I haven’t heard an answer yet. And frankly, I don’t expect one. By refusing to disclose the underlying data even to members of Congress, the administration is making it impossible for anyone to judge, independently, whether that statement is correct. 5.) The US intelligence document clashes with all of the other evidence. As I wrote in my article, “New Chemical Weapons Attack In Syria Another False Flag?” it has been the case with every other propaganda push against Assad regarding chemical weapons, that there is absolutely no evidence to implicate the Syrian government in the launching and use of chemical agents against the Syrian people or even the death squads. In fact, the accounts being published throughout the mainstream media are very suspect in their own right. “Activists say,” of course, can be translated merely to mean “death squads” say, as the activists being referred to are indeed nothing more than terrorist killers - politically, ideologically, and physically - invested in the outcome and presentation of the Syrian crisis. In short, these individuals have a vested interest in the blame for these attacks being placed on Assad, popular opinion being turned against the Syrian government, and some type of condemnation or military action being taken against the Syrian army. Even more interesting, is the fact that the chemical weapons attacks come just days after a team of U.N. chemical experts entered Damascus and checked into a hotel a few miles from the targeted area. With this in mind, one must ask “why would Assad order the use of chemical weapons in this area at such an inopportune time?” Given the track record of Assad’s cleverness, this seems to be an incredibly foolish move, even as the Syrian army has gained the clear upper hand against the death squads. Why detonate chemical weapons in front of UN chemical experts? Why wait until after they arrive to do so? Why detonate chemical weapons so close to them? Logically, it would make little sense for the Syrian government to employ chemical agents at such a time, particularly given the relatively close proximity of the targeted towns (to the U.N. team). Nonetheless, the Ghouta region (where the attacks were reported) is well known for its opposition leanings. Jabhat al-Nusra has had a long-time presence there and the region has borne the brunt of sustained military pressure for months now. When Lukashevich refers to “biased regional media” he most likely means news agencies such as Al-Arabiya who, according to William Engdahl, was the agency who broke the initial story regarding claims of 500 deaths from chemical attacks, reports which were taken almost entirely from “activists” aka death squads. After the initial reports were made by Al-Arabiya the massive wave of Western media picked up the story and ran with it, inflating the numbers of victims almost every hour, finally reaching claims of 1,300 deaths. Al Arabiya, the origin of the story, is not a neutral in the Syrian conflict. It was set up in 2002 by the Saudi Royal Family in Dubai. It is majority-owned by the Saudi broadcaster, Middle East Broadcasting Center (MBC). Saudi Arabia is a major financial backer of the attempt to topple Syria’s government. That is a matter of record. So on first glance Saudi-owned media reporting such an inflammatory anti-Assad allegation might be taken with a dose of salt. Lukashevich pointed out that similar reports about Syrian authorities allegedly using chemical weapons have popped up before. However, the information has never been confirmed. In Moscow’s view, the latest possible “provocation” might be the opposition’s attempt to get support from the UN Security Council and undermine the Geneva peace talks on Syria. Russia believes the incident should be thoroughly investigated by professionals. It urged everyone who has influence on armed extremists to do everything possible to finally put an end to such provocations involving chemical poisonous substances. Lukashevich and the Russian government have ample reason to suspect that the recent chemical weapons attack in Syria was the handiwork of the death squads instead of the Syrian government. Since the ridiculous “red line” talk has been repeated in government halls and press conferences since late 2012 by both President Barack Obama and then-Secretary of State Hillary Clinton as well as French President Francois Hollande, the idea that the Syrian government would be the party to actually use chemical weapons was patently absurd from the beginning. 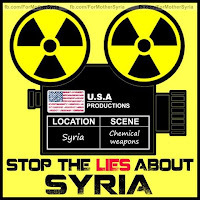 As far back as June 2012, the pieces were clearly seen being moved into place in order to create the environment and subsequent chain of events for a successful false flag attack used to justify an invasion of or, at the very least, some limited military action against Syria. However, the more hidden aspects being used to create infrastructure for such an event could be seen going back even further. I would encourage the readers to access my article “Propaganda Overdrive Suggests Syria War Coming Soon,” in order to get a glimpse into the false narrative supplied by the Western media regarding a series of propagandized chemical weapons attacks inside Syria as a justification for military action. Add this to the recent report provided by Dale Gavlak of Mint Press which revealed admission by Syrian death squads that they themselves were responsible for the chemical weapons attack in Ghouta and one can clearly see that the evidence being presented by the United States regarding these attacks is hanging by a thread with much of what is being promoted as fact not existing at all. It is also important to note that the death squads claimed they were given both the chemical weapons and their salaries by Saudi Prince Bandar bin Sultan, also known as Bandar Bush due to his close ties with the Bush family. The weapons were apparently supposed to have gone directly to al-Qaeda fighters such as Jabhat al-Nusra. In the end, the recent “intelligence documents” and alleged proof provided by the Obama administration is nothing more than Iraq 2.0 – a determination to go to war with a Middle Eastern nation which has done absolutely nothing to harm the United States on the basis of fabricated intelligence and propagandized “proof” surrounding lies of “crimes against humanity,” and WMDs. If anyone has the feeling that somehow we have been here before it is because we have. We cannot afford another foreign military adventure where untold numbers of innocent people will be slaughtered for the good of geopolitical concerns, the military-industrial complex, corporations, Wall Street, or esoteric agendas. We cannot afford such a war either financially, physically, or spiritually. It is time to get off the Path to Persia while we still have the ability to do so. Brandon Turbeville is an author out of Florence, South Carolina. He has a Bachelor's Degree from Francis Marion University and is the author of three books, Codex Alimentarius -- The End of Health Freedom, 7 Real Conspiracies, and Five Sense Solutions and Dispatches From a Dissident. Turbeville has published over 275 articles dealing on a wide variety of subjects including health, economics, government corruption, and civil liberties. Brandon Turbeville's podcast Truth on The Tracks can be found every Monday night 9 pm EST at UCYTV. He is available for radio and TV interviews. Please contact activistpost (at) gmail.com.